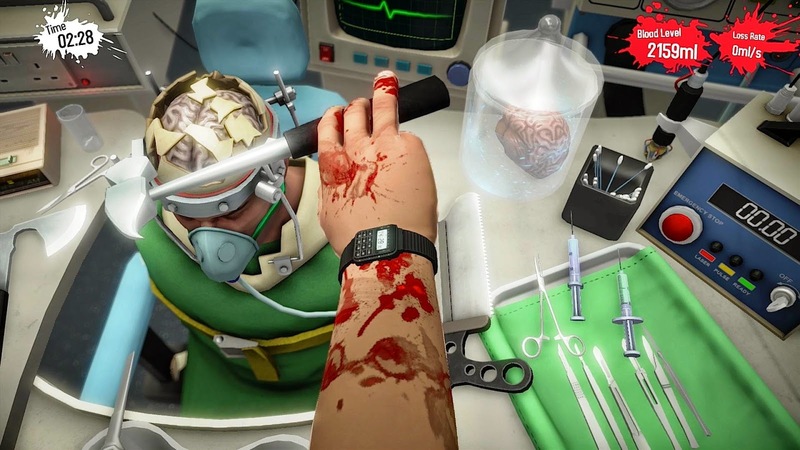 If you've never played Surgeon Simulator before, here's everything you need to know. You play as Dr. Nigel Burke, one of Britain's top surgeons, and must complete heart, kidney and brain transplants in a variety of environments, from the hospital, to an ambulance, to the International Space Station. Oh, and you can only use one hand. By now, you've probably figured out that this isn't the most serious of games. 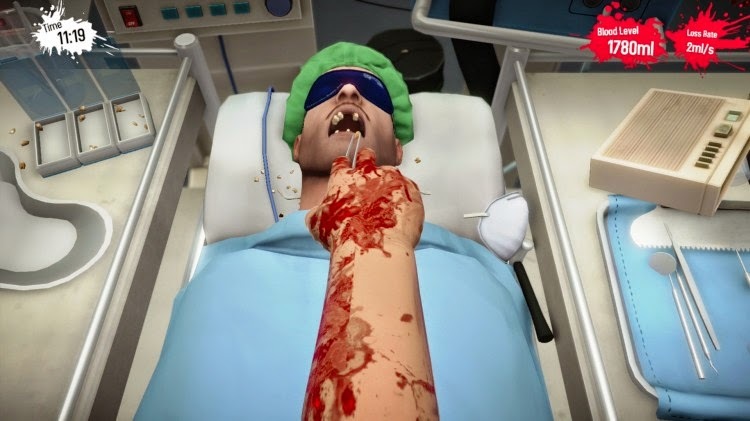 The A&E Edition of Surgeon Simulator also adds teeth and eye transplants, which both feel a lot different from the core surgeries, as well as introducing some awesome new features that players of the original will definitely appreciate. For example, you can't just pick up the teeth and drop them in like you can in the other surgeries, you have to gently grab them with tweezers and place them exactly where you want them to go. It's nice to be able to use one of the tools for something other than mindless hacking. As well as the new operations, there's a new location, which lets you do surgery whilst wheeling the patient through the hospital's hallways. It's very similar to the ambulance level, with the addition of moving tables, which bring and take away tools randomly. It's usually not a problem, unless Bob is bleeding out and you can't find the injection to stop him from doing so. To control Nigel's hand, there's an incredibly simple three-button method. To pinch his thumb and index finger together, you press R1, and to grab with the other three fingers, it's R2. Then you press and hold L2 to lower the hand and to move the arm around, you use the left stick. The most interesting aspect of the control scheme is that to rotate the hand, you use the motion controls of the DualShock 4, and it works surprisingly well. Motion controls are often undesirable, but in this case are actually preferable over using the analogue stick (which you can switch to in the options). Surgeon Simulator: A&E is the definitive version of an already amazing game, and it's great to see Bossa Studios developing for the PS4 so early in the console's life. They have nailed the control scheme, the new locations and surgeries are great, the updated graphics are really easy on the eye, and it's still as hilarious as it was when it launched. There may not be enough new content to entice back players of the original, but that doesn't stop it being a standout title on the PS Store.